Successfully Added iMAN V3 Android Rugged Smartphone - 4 Inch OGS Screen, Quad Core CPU, IP68 Waterproof + Dust Proof Rating, Shockproof (Black) to your Shopping Cart. “Try not to become a man of success, but rather try to become a man of value”, is a famous quote by Albert Einstein and this phone by iMan is a phone of value, however it will also be a great aid to your success. The first thing you will notice when you grip this masculine phone is that it has a tough rubber exterior that has every hole and port sealed. This type of sealing ensures that the phone is tightly protected from the ingress of water and dust; therefore it has been rewarded with an IP68 rating. 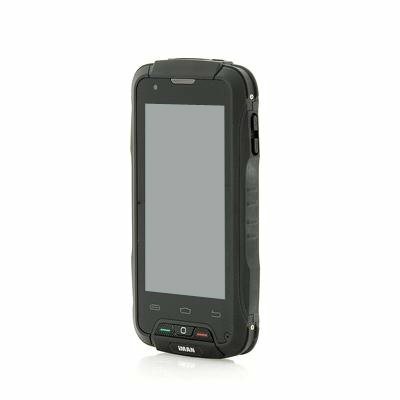 Take the iMAN V3 rugged phone next time you do some outdoor activities where you can’t control the elements or the terrain because this phone will not let you down. Unscrew the back of this Android phone with the accompanying screw driver to access the removable battery as well as two SIM card ports where you can simultaneously run two separate numbers through this one device. This phone can withstand a few knocks as well due to its shockproof design plus the 4 inch display uses OGS technology, which is where the thickness of the display is reduced and replacing the touch module glass with a thin layer of insulating material. The outside of the phone is amazing and so is the inside as there is a powerful quad core processor than ensures a smooth performance when using the Android 4.4 KitKat operating system that comes pre-installed on this tough phone. 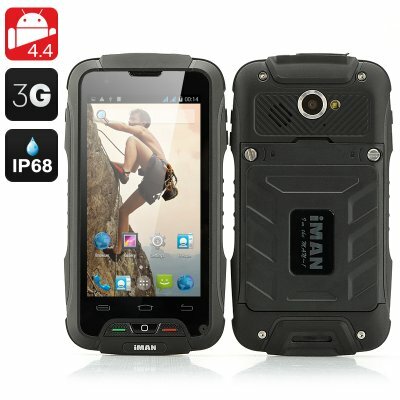 Be a real man with the iMAN V3 rugged phone.